Mr Saiyed Ali Sibtain Naqvi or Naqvi sir as he’s famously called has lived Hockey in his teenage, seen Hockey from the boundaries of stadiums & improving Hockey internationally. Yes, Mr. Saiyed Ali Sibtain Naqvi is someone who has Hockey in his veins, Hockey in his diction, Hockey in his soul. A well-known Hockey player of his time, player as good to have Mr. Hockey “Dhyan Chand” quoting him as among the best, a coach & an international umpire later in his life before devoting his life to improvement of Hockey as an International Consultant. I admire your efforts to raise a very important question. It is cricket which had brought down the downfall of Hockey. Sports in India played on an amateur level where there are little chances to survive against, the professional sports like cricket where multi-million organizations are supporting cricket including the youth in the streets. See the case of IPL. It is a business to generate billions in sponsorship, TV rights, marketing and Advertisements. I may mention that few countries are playing cricket as compared to Hockey in the world. The young generation is attracted towards cricket where chances of earning financial gains are better. Compared to that, Hockey players have to struggle to survive in the face of realities. There are little financial prospects as compared to hockey. There is now a ray of hope with the aid of International Hockey Professional hockey had been introduced last year which has offered attractive dividends not two India on the universal basis. The grass root Hockey is still suffering as the facilities and infrastructure are not available as compared cricket. Thus a young Hockey aspirant thinks ten times before adopting hockey to earn livelihood. It was realized by the India during the London Olympic 2012 that the dismal performance was the result of their neglect of Hockey. Several organizations, players, well-wishers had urged, the agitation, demonstrations were made throughout the country. The government urged to intervene and bring back past glory. Period 1940-1949 at Sitapur U.P. India – I was educated in a small town called Sitapur U.P. India though born in Amroha. The main recreation and sports in those time in schools was hockey and football. The games were played on seasonal basis. Hockey was played throughout the season. There was great enthusiasm for schools, clubs and district hockey and regular tournament were organized on Mohalla and in different region, so there was hockey culture in remote part of India. Cricket has taken later on. Cricket used to be played only on Sundays as a gentleman’s game. Most important that in schools, it was compulsory to play hockey in games period during school time under the P.T. teacher and he used to coach the different classes team. I still remember that all the missionaries school had the hockey teams of their schools and used to play tournaments where large crowd and parents used to turn up supports their children. Beside there was a mohallah (Region) Hockey one day tournaments on Sundays on the make shift grounds some time on Mohalla street as there was a no regular ground available in the area. During that period – The most outstanding feature was the name of wizard – Dada Dhyan Chand and his brother Roop Singh. The participating team used to name the teams as Dhyan Chand XI and Roop Singh XI. Players called themselves as Dhyan Chand and Roop Singh and copied their style of playing as they were worshiped as heroes. It was due to the fact that Dada Dhyan Chand had Captain the 1936 Berlin Olympics (Germany). This environment was due to the fact that the wizard of hockey captain of Indian Olympic team had won the Olympic gold medal and he was honored by Adolf Hitler and given the title of wizard as India had humbled the Germany 8-1 in the final at Berlin Olympics. Hockey at that time was a middle class game. But I must admire British who had introduced Hockey in India. They were providing all supports to encourage hockey in Railways, army, Navy, Air force and other services like police and commercial organizations. I was most fortunate that after playing Govt. high school in Sitapur as I was Captain of Schools XI and Quzara club in 1949. I had migrated for higher studies to Lucknow. I may add that govt. high school Sitapur use to tour for a week to play friendly matches Hockey in Lucknow each year. In Lucknow I had joined the Govt. Jubilee College known for its Hockey and Football teams. Soon, I was discovered by none the than K.D. Singh Babu the Captain of 1952 Olympic. He was most dynamic personality who had selected me from M.Y.A. club to play Lucknow district XI in U.P. championship in 1951 at Allahabad. It was considered a great break through as I was selected for U.P. XI. For Calcutta Nationals 1952, K.D. Singh Babu had recommended me to join then B.B.C.I. Rlys. 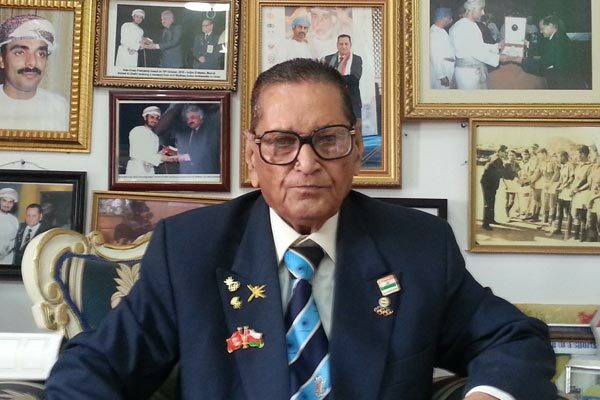 (Now Western Rlys) and sent me to join another legend stalwart Dada Kishan Lal – Captain of 1948 Olympic in London. 1953 – While representing the western Rlys in “Dada Dhyanchand Hockey tournament” at Delhi. Dada Dhyanchand had spotted me in the final match against kirkee united while representing western railways and winning the Dada Dhyanchand trophy by beating the famous Kirkee United Puna in the final. Dada DhyanChand was impressed by my performance and same evening during a celebration he announced my name as “Maulana” of Hockey. I continued playing for Bombay XI, Rlys XI, Rest of India XI, (Cochin National 1969) and attended 7th Indian team selection camp. 1972 – I took over as the coach/Manager of western railway Bombay, The Manager of Indian XI for 1973 and 1975 world cups. During this period Dada Dhyan Chand had recommended my name to Rlys. Sports control board to be trained in NIS Patiala. Incidentally Dada Dhayan Chand was Chief Coach of NIS Patiala. 1976- After I completed my NIS training that I was nominated in 1978 as the national coach of Indian Women’s team for Madrid Spain and tour of Holland, France and U.K.
1979 – Accompanied Indian Women’s team to Pre-Olympic Moscow. 1981 – Declared International Umpire. 1983 – 2003- Joined and established Oman Olympic Committee. I still continuing as the sports consultant Oman Hockey and Future Management & Economic Consultancy. 1976 Montreal – Canada Olympics it was for the first time in history that artificial hockey pitch called Astroturf was introduce before that the natural grass used to be maintained all over the world. 1978 – It was second time since Modern Hockey came into existence in 1976. It was first world cup which was played on Astroturf in Mexico. The introduction of synthetic ground had a great impact on the composition of synthetic Hockey stick. The ball and other equipment for players and goal keepers were changed. The FIH. brought changes in umpiring rules which changed the complexion of the Hockey on European style. The European teams had adopted the system in advance. India had neglected the reforms and continued to play old Asian style. It was a tussle now between Asian style and European style. New changes had a bad impact on the performance of Asian leading teams like India, Pakistan, Korea. They were relegated to the bottom in ranking of F.I.H. for the Olympics and the World Cup. The new champion emerged were Holland, Germany, Australia, Spain, England, Belgium, Argentina and New Zealand. The Asian teams woke up to the situation when the lost title to European and Australia in recent times Korea had emerged as a new force to threat the India and Pakistan. Now big six – India, Pakistan, Korea, Malaysia, China and Japan are adopting new style to counter the evergreen challenge. The Asian style had artistic and thrilling Hockey which has disappeared. The fate of the Matches is now decided on penalty corners, penalty strokes and the tie breakers. These are Major factors which differentiate the Modern Hockey to old Asian style as the introduction of Astroturf and changes in the new umpiring rules. The standard in India needs to be updated as in the Modern Hockey. The old training system does not fit in the modern hockey. The use of Modern method of teaching and training is to be adopted. The use of Modern scientific technologies must be introduced and adopted. Improve the present infrastructure with modern training equipment. Use the sports science for improving standards. Research and development department must be established to achieve the goals. The concentration on physical fitness and conditioning training must be compulsory. More junior or grass root level competition must be organized on Astro-turf. The entire concept of training has to be changed. The team must be trained for physical fitness and Importance must be attached to the recent developments. The following officials are required of the team’s modern training. Present system of training in India is inadequate as compared to European countries. Hockey is our national game and Indians love for Hockey is evident when the team is not performing according to their expectation. It is considered as the national disaster. 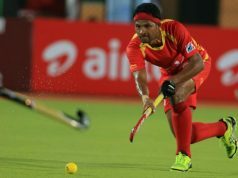 The Indian players are more suited to play Hockey because of their physical structure and the social and emotional importance attached to the game of Hockey. Indian has lot of junior talents all the state teams now are adopting measures. They are forming the new academies and sports hostels for boys and Girls. 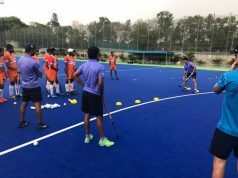 The policy of Hockey India at the moment is to select few players for the camp before participation and hire a foreign coach. This is called a short term policy. The team disbands and next participation new team is selected. There is no follow up of the new talented juniors. The long term policy can produce Jr. and Senior players. The same can be said for coaching staff. It keep changing, hence the responsibility cannot be fixed. The coaching infrastructure is not on permanent basis. The foreign Coaches prefer to bring their own Coaches. 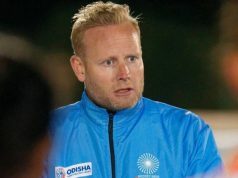 Why not have a pool of Indian Coaches to be trained to accept the European challenge Junior Hockey players don’t get enough chances to prove themselves. There are lots of talented player in each region of India. This is true that modern training and scientific technologies are not available to all. It is only available to selected few who are enjoying the benefit after they are selected to represent the country. The modernization is most important to improve performance and raise the standard of the hockey all over India. Still the present facilities are in adequate to meet the needs of hockey fraternity. There must be modern training centers equipped with latest equipment and technologies along with trained Coaches and experts. In fact the states must cooperate to provide such centers in district level. Most of the schools needs basic infrastructure and other modern scientific technologies as majority of school have no play grounds. Hockey should be included in school curriculum as a compulsory subject as it was in the past. Each School must be provided some people like hockey teacher or Hockey Coach. There should be more competitions on school level. Incentives must be provided to players’ coaches and experts to devote their time and energies. Extra assistance by the schools to the players in case they lag behind in studies and they must be compensated with additional marks. So they do not suffer in class studies and lose their precious year. Provision of playing kit equipment at the cost of school is a must as the cost has gone up very high. Provision of nutritional food and refreshment to the players should be there. 1: – The awareness to the sports culture in the country to adopt hockey. 2: – Campaign on TV, Radio and Electronic media, Meeting, Conferences and seminars on hockey. 3: – The marketing and sponsorship programs to generate funds. 4: – Involve the families and social organizations to assist in organizing training and tournament. 5: – Provide financial security to all players to maintain decent individual training programs. 6: – Reserved job opportunities for the future of players. 7: – Provide incentives to players, parents, Teacher, Coaches and social organizations, who are involve in promoting hockey. 8: – Recognition by the (Sports Ministry) Govt. and other organizations and providing the players assistance after the hockey career as a retirement or due to abnormal circumstances and injuries. This is positively a new initiative to arouse interest in the masses a cream of Indian talents as well as from other Hockey playing nations.It will be a great source of encouragement if regional players are given opportunity. The Hockey India league is played only in important cities like Delhi. It may not attract good crowd. But I am sure there are known centers of hockey such as Bhopal, Lucknow, Calcutta, Chennai, Bangalore, Cochin, Hyderabad, Mumbai, Jalandhar and other capital cities may bring crowds as they like to see and supports good Hockey. No one can predict the actual time as to when the past glory of Indian Hockey will return. I feel and pray that India once again to win the Olympic title in 2016 at Rio de Janeiro (Brazil). Yes, bringing junior Hockey will create new enthusiasm at junior level. In fact any International competition will bring new life provided the media supports and the matches must be televised on all channels. Yes, it’s correct that in some rural areas there are hidden talents and they don’t have opportunities to exhibit their talents. Hockey India and all over the world a programme called “Scouts for talents” is going on. They observe watch and recommend for the new talents for inclusion in the national team. This is a national programme which is not reaching in many places of India. Talent hunters concentrate only on major national events. In some cases the regional federations while taking part in the national championship are losing in early rounds thus the deserving talents have no opportunity. I suggested that NIS Patiala/Bangalore to prepare the rural XI in the junior national. It was wonderful plan. The tribal players were spotted from the rural XI. So please continue this system. I still maintain that by rotating India Hockey league matches in different centers will bring positive results. This will improve the infrastructure at various centers. Yes, more teams will bring better results.